I came up with the idea for this last week when I made some white beans with red peppers as a side dish. It was pretty good but I thought some Mexican chorizo mixed in would make it even better (probably still a good idea to try). As you can see I went with Italian sausage instead and added some sauce. I wanted bigger pieces to go with the beans and also didn’t think chorizo would braise very well. We’re going out to dinner tomorrow night (somebody’s birthday tomorrow, not mine!) so made something easy and not too heavy for tonight. 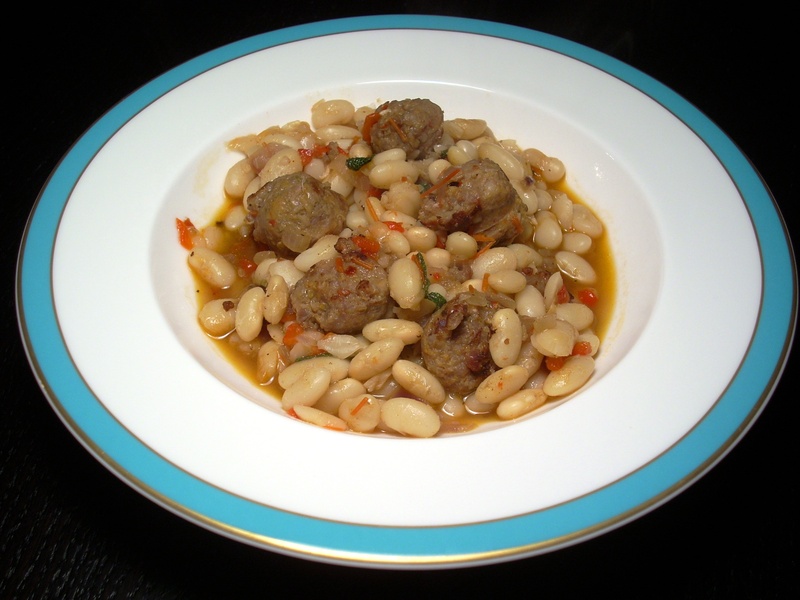 And come on, who doesn’t like a fancy “pork and beans” dinner? I must say, this little experiment turned out really well! The sauce was absolutely delicious. Rich, not too thick but just thick enough to cling to everything. I’m sure you can use canned beans but why would you? I’m really becoming a big fan of the quick soak method for cooking beans. Most recipes tell you beans need to be soaked overnight and if you’re like me, you always forget to do that. With the quick soak you still get cooked tender beans but in much less time. The bean cooking liquid is a great addition to any sauce, soup, or stew as well since it has some of that bean starch in it and can help with thickening when reduced. The peppers and onions also added a nice layer of sweetness that contrasted with the sausage and sauce. It was bowl licking good! The beans: using the quick soak method add the cup of dried beans to 4 cups of water, add 3-4 big pinches of salt, and bring to a rapid boil for 2 minutes. After 2 minutes are up remove from burner, place lid on pot, and let sit for an hour. Drain the beans. Add 4 C fresh water to beans, salt, and simmer over medium heat until tender, about a half hour. Remember to keep testing your beans as I’ve found some beans cook quicker than others. When cooked remove from heat, drain and reserve cooking liquid. You can either remove the skin from the sausage or cut it into pieces with the skin still on. It’s up to you. I left it on this time. In a heavy bottomed pan brown your sausage pieces over medium heat, drain any excess fat and set the browned sausage on a paper towel to drain. Add the pepper, onion, and garlic to the pan and sauté over medium heat until soft and browning, about 5 mins. Deglaze the pan with ¼ C wine and allow to cook off. Next add 2-3 C of the bean broth, the demi-glace, and the browned sausage pieces back into the pan. Increase heat to medium high, bring to simmer and reduce by half. Stir in cooked beans, chopped sage and heat through. Serve when heated and sauce is to desired consistency.